The City of Birmingham Symphony Orchestra (CBSO) has announced that its new music director, in successor to Andris Nelsons (who was in post from 2008 to 2015), will be the Lithuanian conductor Mirga Gražinytė-Tyla. The orchestra's 12 music director, she will take up her position from September 2016. Gražinytė-Tyla made her debut with the orchestra in July 2015 and returned last month to conduct Debussy, Sibelius and Schumann. A native of of Vilnius, Lithuania, and only 29 her father is a choral conductor in Liithuania. 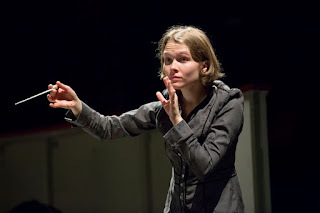 Mirga Gražinytė-Tyla was a Dudamel Fellow with the Los Angeles Philharmonic, eventually becoming Associate Conductor for the 2016-17 season. She won the the 2012 Salzburg Festival Young Conductors Award, and she her debut with the Gustav Mahler Youth Orchestra in a symphonic concert at the Salzburger Festspiele. Gražinytė-Tyla is serving as the Music Director of the Salzburg Landestheater from 2015 until 2017. The CBSO has something of track record in spotting talented young conductors. Simon Rattle was only 25 when appointed, Sakari Oramo was 30 and Andris Nelsons 28. And by appointing a woman to the post of music director of a major UK orchestra goes a little way to showing that the glass ceiling can be breached. Her artistic plans with the CBSO will range widely from Mozart and Haydn to 20th century classics and works by living composers. Coming from the strong choral traditions of the Baltic states and following her role in Salzburg, she will also lead opera projects in Birmingham and will work closely with Simon Halsey, CBSO Chorus Director, on projects with the CBSO’s choruses. The full 2016/17 season will be announced in April.